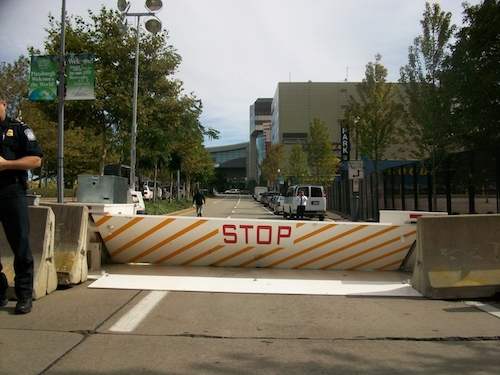 Delta Scientific, the manufacturer of counter-terrorist vehicle control systems, says 20 Delta MP5000 mobile deployable vehicle crash barriers have been ordered by the U.S. Secret Service to protect participants and observers from terrorists using vehicles as a weapon. Provided through Global Access Control Systems (Pittsburgh), these mobile deployable vehicle crash barriers carry a K8 rating (M40 ASTM rating), stopping 7.5 ton (6400 Kg) vehicles traveling 40 mph (64 kph), according to the company. An example of a self-contained MP5000. The self-contained MP5000’s tow into position to control vehicle access within 15 minutes, Delta Scientific says, and no excavation or sub-surface preparation is required. Once positioned, the mobile barricades will unpack themselves by using hydraulics to raise and lower the barriers off their wheels. DC-powered pumps will then raise or lower the barriers. Once the event is over, procedures are reversed and the barriers are towed away.